MEMPHIS SLIM . . .
Hello Blues Hall of Fame ®, I'm Rob Marshall, Memphis Slim's 1st cousin on my Grandfathers side of the family the Chatmans. As I was growing up in Pittsburgh, PA, Slim would occasionally take time out and come to visit us. Or money permitting, we would go to Memphis, TN or St. Louis to catch up to him. When it was allowed, even go on his tours. After he moved to Paris in 1962, we were usually his first stop whenever he came back to visit the states. I also spent time with him in France while I was stationed in Germany in the 70's. My wife and I would take leave and drive to Paris and meet him at the USO that was on the Champs Elysses. Here he had an impromptu greeting and autograph session with all the people there--embarrassingly to me, some wanted my autograph just because I was his cousin. After that we went shopping at some of the men's and women's shops off the Champs Elysses because my wife and I were going to need some "classier clothes" as Slim put it if we were going on the tour with him. And from there we picked up his new Rolls Royce and then went to his apartment on the West Bank. We spent a few nights at his blues club in the basement of his bar that was also on the West Bank--just walking distance from Notre Dame. Then we accompanied him on the last leg of his tour through the southern region of France. He was a regular, household name throughout Europe, and especially so in France where he had a weekly radio and TV show. You couldn't walk 30 feet without someone, or a group of people stopping him to chat, wanting autographs, or saying "Memphis", Memphis", Memphis." All the while he always stayed a joyful, feet-on-the-ground, hard working, craftsman. And I photographed as much as I could. I've been a professional photographer for all of my life and he wanted me to do some promotional shots for him. On a sad note, all of my photo files from the 70s in Europe were destroyed in a flood at my mothers house in 1980. But I'll always have the memories. Throughout the growing up years and the times I spent with him in Europe there are ALOT of stories, sidebars, and anecdotes to tell. And if you'd like, I can relay them to you. On another note, here in Albuquerque, NM, David Lescht at KUNM-FM and I are doing a show on or about Slim's birthday of Sep 3rd, called "Memphis Slim Remembered". And we'll be covering his life and times from my perspective, as I was growing up and the times we spent together in Europe. Plus, I'm going to try and do the song that he always sang to me, as a child, that he never recorded. I know that beside the film "The Sargeant", with Rod Stieger, he made about 6 or 7 movies that were released only in Europe. Do you have access to a filmography to get me the titles? 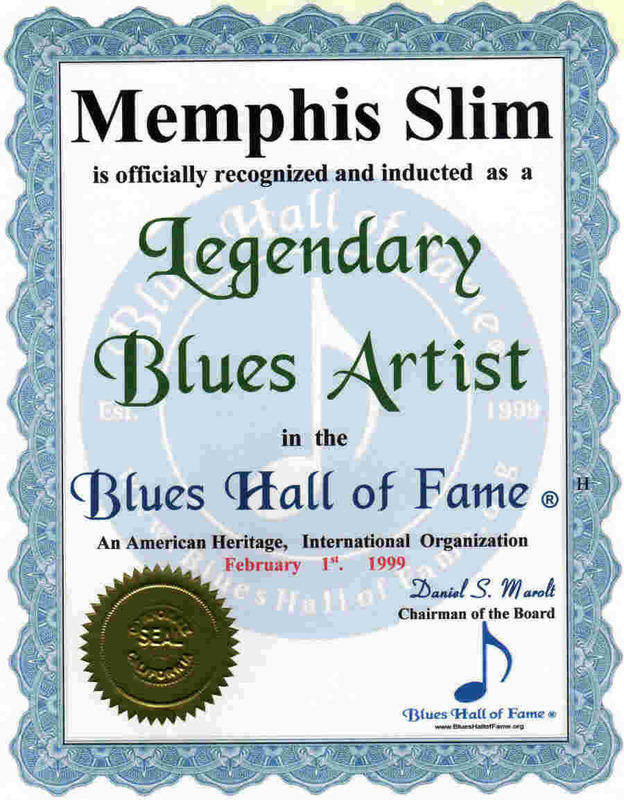 To view what others have submitted click Memphis Slim's B.H.F. Email Page.